I finished a creature originally set for the second, yet held on for the similarities to the Basilisk, for reptilian creatures with bird heads and petrifying gazes. The difference being is that the Cockatrice can fly, so be terrified of that idea of a flying bird dragon with a petrifying gaze coming your way. This creature is also said to have poisonous breath and the methods of killing it is by a weasel or hearing the crow of a rooster. 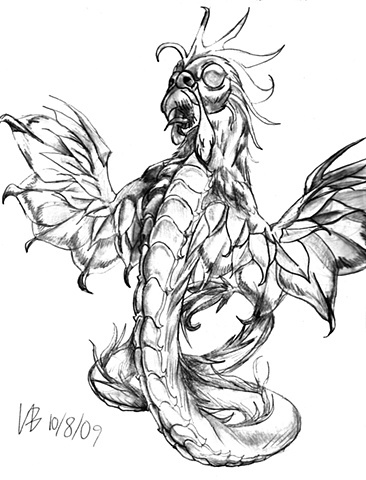 For my depiction, I used the rooster head, yet combined it with a snake's body, similar to a coatl (feathered serpent). while adding transparent feathers and clear eyes to make it a flashy flying death trap.